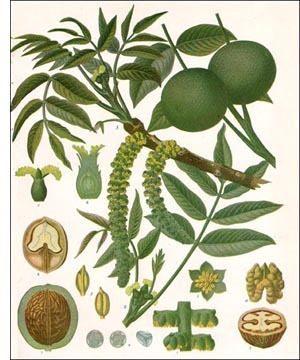 The English Walnut, Butternut, Black Walnut, Shagbark or Shellbark Hickory, Mockernut or Whiteheart Hickory, Bitternut Hickory, and Pignut Hickory are closely related, belonging to the Butternut family. They are large, handsome trees with spreading branches and clean-cut leaves. They are of comparatively slow growth, but hardy and enduring. The English walnut is a tall, large, handsome tree which undoubtedly came from India. All the other members of the Butternut family are common throughout the United States, either growing wild or under cultivation. The wood of the butternut or white walnut and that of the black walnut is extensively used in cabinet making, furniture making, and interior finish, particularly the wood of the black walnut. The earlier craze for black walnut furniture threatened to exterminate the plant, but, fortunately (for the walnut tree), the fashion is waning. The wood is heavy, dark brown in color, of medium hardness, easily worked, and readily polished, though it does not take the glossy polish of the harder woods, as ebony. Hickory wood is very hard, tough, and durable, but it is not suitable for cabinet making, etc., because it warps too much. It is an excellent wood for making handles for tools of all descriptions, oxen yokes, hoops, walking-sticks, whiffletrees, wagon stocks, etc. Its tensile strength is enormous, being said to be equal to that of wrought iron. The seeds (kernels) of the English walnut, butternut, black walnut, and shagbark hickory are edible and greatly relished, while those of the bitter and pignut hickories are not edible. Eating too many of the kernels causes distressing dyspeptic symptoms because of the large amount of oil which they contain. Salting the kernels before eating or taking a little salt with them is said to lessen these disturbances.